Youth Basketball Clinics | Healthy Buffalo - Creating a Healthier and More Vibrant Community! RSVP for the next clinic run by PeacePlayers International Co-Founder Sean Tuohey joins up with Healthy Buffalo All-Star Quintin Redfern to run our second Healthy Buffalo Youth Basketball Clinic. 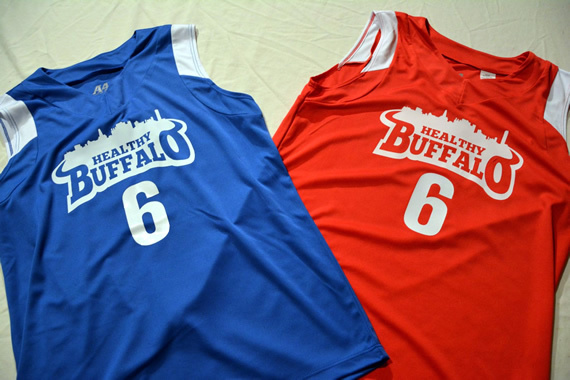 All participants will receive an authentic Healthy Buffalo pro jersey as worn by the Healthy Buffalo Dream Team, partake in a group warmup, followed by a number of station drills to learn the fundamentals of basketball. In true Healthy Buffalo fashion photography and a full video rebroadcast are included in the price of admission. Registration is now open! Watch the video below to check out footage from our first clinic. World class instruction by PeacePlayers International Co-Founder Sean Tuohey and professional basketball trainer Quintin Redfern. A custom-made authentic Healthy Buffalo All-Star jersey for all participants. 60 minute clinic learning the fundamentals of basketball in a very lively and fun environment. Foods and beverages following the game.